A new trailer appears for the Monster Hunter-esque game. There's not a hint of daunt on display in the latest trailer for co-op action RPG Dauntless, and yes, 'co-op action RPG' is a fancy way of saying 'Monster Hunter-style game'. The major difference between this and yer actual Monster Hunter is that, hooray, it'll be on PC (and no, the Monster Hunter MMO didn't count). Another, smaller difference is that you'll be hunting 'behemoths' instead of 'monsters'—and those are totally different things, before a lawyer pokes their head out from a nearby bush. Brace yourself for a couple of minutes of cinematically shot, presumably in-game footage, featuring a group of hunters whacking a couple of beasties square in the chops. There's an open beta for Phoenix Labs' free-to-play action RPG coming late this year, and you can sign up in readiness over on the official site. 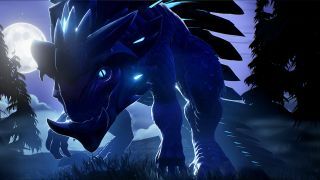 Unusually, the system requirements have also been released well in advance, and the good news is you won't need a crazy powerful PC in order to run Dauntless comfortably. If you're wondering what PC Gamer's Tom Marks thought of the game after a hands-on, have a watch of his impressions video below.